Dr. Jean-Pierre Garnier is the chief executive of GlaxoSmithKline, which has been sued over its drug Paxil, an antidepressant. n a novel claim testing the way that the $400 billion worldwide pharmaceutical industry is regulated, the New York State attorney general, Eliot Spitzer, sued the British-based drug giant GlaxoSmithKline yesterday, accusing the company of fraud in concealing negative information about its popular antidepressant medicine Paxil. The civil lawsuit, filed in State Supreme Court in Manhattan, contends that GlaxoSmithKline engaged in persistent fraud by failing to tell doctors that some studies of Paxil showed that the drug did not work in adolescents and might even lead to suicidal thoughts. Far from warning doctors, the suit contends, the company encouraged them to prescribe the drug for youngsters. "The point of the lawsuit is to ensure that there is complete information to doctors for making decisions in prescribing," Mr. Spitzer said in an interview. "The record with Paxil, we believe, is a powerful one that shows that GSK was making selective disclosures and was not giving doctors the entirety of the evidence." GlaxoSmithKline officials issued a statement yesterday saying in part that the company "has acted responsibly in conducting clinical studies in pediatric patients and disseminating data from those studies." On Wall Street yesterday, the American depository receipts of GlaxoSmithKline fell $1.38, or 3.2 percent, to $41.39. Mr. Spitzer filed his suit at a time that the tendency of many drug companies to publicize only studies with positive results has come under increasing criticism. As he has done in actions involving the financial services and mutual fund industries, Mr. Spitzer is entering regulatory terrain that has been largely the preserve of the federal government, in this case the Food and Drug Administration. This time, though, he maintains that his suit is not a criticism of federal drug regulators. "This isn't Harvey Pitt and the S.E.C.," he said, referring to the former chief of the Securities and Exchange Commission, whom Mr. Spitzer criticized as less than vigorous in enforcing federal securities laws. Instead, Mr. Spitzer said that the F.D.A. had been hamstrung by court rulings that have used free-speech arguments to limit the agency's power to regulate what drug companies can say to doctors. Such rulings do not limit his powers, Mr. Spitzer said. "You cannot invoke free-speech arguments as a defense to fraud," he added. 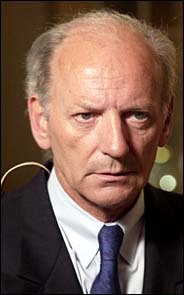 Similar suits against other drug companies are likely, Mr. Spitzer said. "This is an area that we're interested in," he said, "and I think there are other cases out there that are analogous." 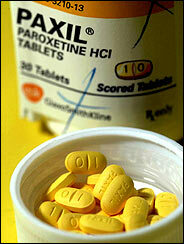 That is what it did last year, when it warned doctors on the use of Paxil for adolescents and children. Earlier this year, it required antidepressant makers to strengthen suicide warnings on labels. British drug regulators have banned the use of all but Prozac for the treatment of depression in adolescents and children. Prozac, made by Eli Lilly & Company, received a major American endorsement this week when the widely anticipated results of a study sponsored by the National Institute of Mental Health indicated that Prozac was superior to talk therapy alone or a placebo in treating depression among teenagers. The study did not address suicide risks. Civil suits have been filed against Glaxo and some other makers of antidepressants by patients or surviving relatives, contending that the drugs caused violent or suicidal behavior. Some criminal defendants have contended that violent acts were a result of using the drugs. Mr. Spitzer's lawsuit is part of a broad assault by prosecutors on the drug industry's marketing practices. Last month, for example, federal prosecutors in Boston announced a settlement with the world's largest drug maker, Pfizer; the company agreed to pay $430 million and to plead guilty to charges that its Warner-Lambert unit promoted the drug Neurontin to doctors for the treatment of conditions where no benefit had been proved. TAP Pharmaceuticals agreed to pay $800 million for inappropriate marketing practices, and its former executives are facing federal criminal charges in Boston. Schering-Plough has acknowledged in regulatory filings that it is likely to be indicted for improper marketing practices. Other companies are being investigated. At issue in most of these investigations, including Mr. Spitzer's Paxil suit, is the marketing of approved drugs for off-label uses — those not specifically approved by the F.D.A. While doctors are free to prescribe an approved drug for any use, the manufacturers are supposed to limit their marketing to those uses with F.D.A. clearance. The new wrinkle in Mr. Spitzer's suit is his argument that a drug maker is committing fraud if it does not tell doctors about trials of a medication that raise safety concerns.